Crazy, by Google’s definition, refers to something that’s “mentally deranged, especially as manifested in a wild or aggressive way.” Synonyms include insane, deranged, lunatic and — my favorite — out of one’s mind. Every domain name transaction has a buyer and a seller. The price is all but relative and starts with the seller’s asking price. This is the only place where a little bit of crazy may come in. Owning a mediocre domain and asking $250,000 for it may seem a little crazy, but if you get a counteroffer then crazy is good. This type of crazy also falls in line with the simple notion of “if you don’t ask you don’t receive” — a basic foundation of anyone selling anything. Where the word crazy gets thrown out the window is when the potential buyer makes an offer. People do not throw money away. When a counteroffer is made, the exact value of that domain name to their business is known and a financial offer is made that represents this value. So, before a selling price is established you already have two very sane people negotiating a deal. There is no crazy here. For first-time buyers and people not familiar with the domain name industry, it’s important to realize that good domain names are incredibly valuable assets today. There is a thriving investor market for premium domain names and an ever-increasing demand for one-word and two-word meaningful domains from companies. In fact, if you have interest in a good domain name then you can almost bet someone else has inquired about the domain name in the past. How are Domain Names Priced? It all depends on who you ask. Every investor has their own pricing model, and different expectations of return. Some only sell a few a year while others like to price them lower and focus more on quantity. However one prices a domain name is a personal choice and, as with almost any other rare investment, price is all but relative to the seller’s interest in money and the expected value relative to the buyer’s needs. Over the last 20 years I have been on the receiving end of almost every imaginable rebuttal for price. From the student looking for a deal (coming from a high-level executive e-mail at a major bank) to “I’m a nun, please can you give me a deal” to one of our most famous internal threads where the person’s maximum budget was initially $50 and then, magically, a few weeks later they were able to come up with $85,000 to buy the name. Our job as brokers is to represent the client (whether a buyer or seller) and that includes educating both sides of the fence on domain name values. Sometimes the seller’s asking price is so high we prefer to work on other opportunities and sometimes a buyer needs to understand why domain names are valued so much. Our primary initial goal is to qualify people. Just like an auction house may require a deposit to secure a bidding handle or a real estate agent request your profile before seeing a luxury home, we are focused only on negotiating with people who can qualify as a potential buyer, relative to the seller’s price expectations. Of course, not everybody is qualified. In the spirit of transparency and education here are a few of our favorite lines from people inquiring about domain names, and a typical reaction from the seller. Personally, this is our favorite statement from a potential buyer. It’s almost the equivalent of us telling the owner of the oceanfront beach home — “wait that’s my house” — explaining that we always dreamed of the home, so in essence (because we had a dream) it’s our house. Maybe we can bring the word crazy back in here. A few people may actually have the right to a domain name with a valid trademark, but owning a trademark is not a general “pass over the domain please” piece of paper. Trademark law is very complicated and many things, including the use of the domain, when it was registered, its generic factors and so much more, all contribute to whether or not having a trademark provides you with a right to a domain name. In fact, it’s very rare for a trademark holder to win a generic domain. For most people, the best strategy is typically to make an offer for the domain because, if your case loses, you can bet the owner is going to likely substantially raise the price. Domain name owners who traffic in typos and collect trademark names typically do not argue since they know from the start there is risk associated with these. Generic domain name holders, on the other hand, will typically fight to the end to keep their asset and they usually prevail. I needed a number for a subject line, if you really want to know. Whether its $25,000 or $250,000 is not really relevant. What is relevant is how much a domain name is worth to your business versus the asking price. Remember the asking price is usually just a starting number. The reason I picked this number arbitrarily is because many domain name owners do the same thing. Before reacting to a price you need to read and understand more about domain names. Having to explain why a great domain is priced so high is only going to get a vague response purely because the sellers we represent are looking for buyers who understand values. Asking us to justify an asking price pretty much discounts any credibility you have as a buyer. However, if you put a reasonable counteroffer in and explain why, then odds are we can work with the seller on that. Very few high-valued domains are ever sold at asking price. There is almost always some negotiation. The good news is that, if you are a real foundation and the domain is going to be used, then some owners may be influenced by that. Some, not many, but some. The bad news is that a lot of people try this line and it’s not something many even respond to anymore. Cool. We wish you the best of luck in the future. Come back when you have a job, and savings. Owners do not steal domains. They buy them in auctions and from other owners. If your name expired and you forgot to pay the eight bucks then sorry — win some, lose some. Okay, this is where we need to transition out of common replies and talk about domain name values. You never want to assume you can buy it later. Hobi Michalec of Domain Holdings wrote a fabulous article on this exact scenario when selling the domain name BlueStar.com. Patient and/or aggressive tactics can often backfire on you. Life is too short and time is money. You often can’t afford not to have that domain name. Why are domain names worth so much? To answer this question you really need to get past the initial cost of a domain name and understand why a premium domain name is so valuable. Back in the mid-90s, domain names were free and today they are generally available for anywhere between $8 and $100 annually. But, like real estate, almost all the good .com domains are primarily gone — and if they were available today, no one would ever let you register them for anywhere close to eight dollars. Keeping in line with real estate, it’s fair to say that almost everyone reading this would buy real estate today at 1995 prices. Hindsight is 20/20 except if the Blue Jays win the World Series, and then I will say I knew that. You see, domain names are not just a rare asset — a collectible or a modern art piece only a few will ever see. The right domain name can save you thousands (even millions) in marketing costs, help expand your brand authority, increase your brand recognition and make you and your company look smarter. In short, a domain name is everything. A $25,000 domain name is still incredibly cheap compared to the value received by almost any other marketing source. A large roadside billboard can cost upwards of $30,000 for every four-week period, according to Blueline Media. According to Entrepreneur magazine, radio ads can easily cost $8,000 to $12,000 a month for smaller companies. The average small business using AdWords spends between $9,000 and $10,000 per month, according to Wordstream. Let’s try this again, but annually. A large roadside billboard can cost upwards of $390,000 annually, according to Blueline Media. According to Entrepreneur magazine, radio ads can easily cost $96,000 to $144,000 a year for smaller companies. The average small business using Google AdWords spends between $108,000 and $120,000 annually, according to Wordstream. So what happens the next year? You get to spend it all again. A domain name, on the other hand, typically has a single fee of less than $100 the second year. Whether you own a bad domain name or a good domain name it still needs to be advertised. Our media comparisons above are shown for you to understand how much money is spent on other areas of your business to put the relative cost of a domain name in perspective. When you’re spending your money on advertising it’s important to stay in the real world and keep it simple. The KISS (Keep It Simple Stupid) acronym is more important than ever with domain names. For all of these advertising costs, your ROI is going to be better with a better domain. Why? You are asking people to remember and trust you. And people are not the brightest, let’s be real. Collectively, the human race is not full of Einsteins and Jeopardy! winners. If your domain name includes a hyphen, ends with inc/llc, starts with THE, has 48 characters or is something your employees cannot spell, your customers cannot type and even you get mixed up on, then really … why are you questioning the need for a better domain? Many online ad publishers have quality scores built into them. These quality scores help determine how much your ads cost, your rankings and more. Having a better domain name often translates to a better quality score and lower pricing. It’s true. Would you trust a doctor from doctors.com or thedoctorintheparkclosetoyourhouse.com more? Time is the ultimate currency, and in the business world every minute costs you money. Every minute your employees waste having to spell your domain name, or a customer confuses your domain name with a better version, or how many times it takes for a customer to remember your website — all of these (and more) have very real financial costs associated with them. If you don’t own the very best version of your domain name you are losing money and telling your customers that you are second tier. Using the Whisky.com example above a company could be using aboutwhiskey.com for the last 15 years but as soon as someone calls them from Whisky.com you can bet the consumer will have interest in listening — because the implied authority of being the better brand is built into the domain name. Should I stick with a .com? What about the new domains? We all wish we registered more domain names 20 years ago. The Internet is changing and many of these new domains are incredibly authoritative. For some, they are the answer. For others, a .com or .org or country code is more appropriate. It really depends on so many factors. There is no blanket answer for everyone. There are millions of these new domains such as .link, .guru and .club already registered. Launched only 18 months ago big brands like Google, Lady Gaga, LionsGate, TED, Merck and many others have acquired and started using these. Tens of thousands were sold in early access auctions costing upwards of $12,000 + each and more are registered every day. — Again, $25,000 is sounding cheap. Because it is. There are so many reasons for owning a good domain name that at this point you either get it or you don’t. The key is not to be upset if somebody buys “your” domain name, but rather focus on understanding the true value of the domain name to your business and then deciding whether or not to obtain the budget for an acquisition. How do I find a broker that I can trust? This is a fair question. The domain name industry is small, but it also has grown tremendously over the last few years, especially with the Chinese investment in domain names, which you can read more about here. Finding the right broker means you need to find someone who represents your best interests. 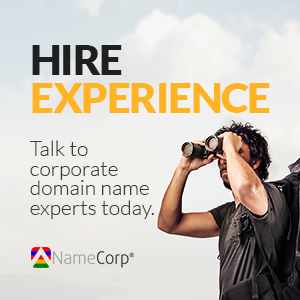 There are many great brokers in this industry who regularly sell premium domain names and have industry awards and nominated staff, including eNaming, Igloo, Media Options, DomainNameSales, GUTA and, of course, my company NameCorp™. Every broker operates similarly; you need to find the one you are most comfortable with. It’s really not much different than choosing a real estate agent. A great place to start is DNJournal.com to learn more about sales and understand industry names. TheDomains.com, DomainInvesting.com and DomainNameWire.com are three of the most popular sites related to domain name news. DomainSherpa.com is a great site to watch interviews. DomainShane is a great blog who showcases a high-quality list of domains in auction every day. GGRG is an amazing resource to learn more about Chinese and short domains, ran by Giuseppe Graziano. And everyone should register at Domaining.com for an easy RSS feed of the top domain name articles every day. For tools, DomainIQ is one of the best resources. With an account you can quickly look up WHOIS information, do reverse searches on DNS servers and more. If there is ever a geeky data side to you then DomainIQ is the ultimate place you want to spend your time. Warning, it’s highly addictive. Of course, you can also always email us at sales@namecorp.com and we will be happy to advise you. What you can take away from this article is that good domains are quite valuable. And there are a lot of professionals who understand domain names, and can provide solid advice about buying/finding the right domain name for you. I know very little about buying real estate so you can bet I am going to hire a realtor to help with a home purchase. It’s probably a pretty good idea to do the same when buying a domain name.